What's the first thought comes to our mind when A.C stops to work for three long days during the peak summer . Either , you escape to a hill station or simply surf the net for some breathing pictures of the Himalayas. 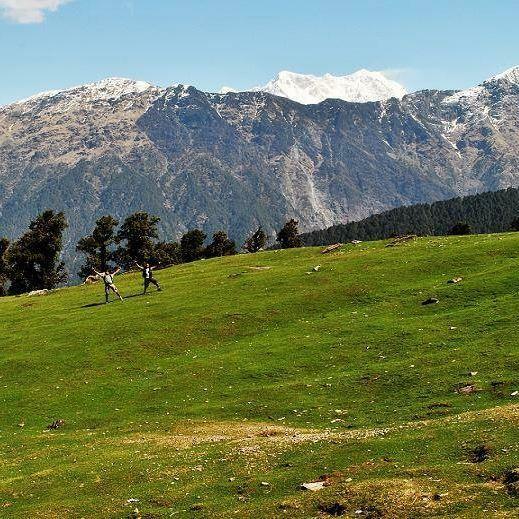 This article narrates a journey, taking the readers the land of whispering medows This is one journey to Chopta which every readers who like to embark upon. Expression stops where beauty begins ……! "The problem is with the compressor, we shall get it repair in a day", commitment came from the AC mechanic. Two days and hundred phone calls later, we got accustom to the temporary table fan installed in our office cubical. The third day was Wednesday, when I received a link from my wife. 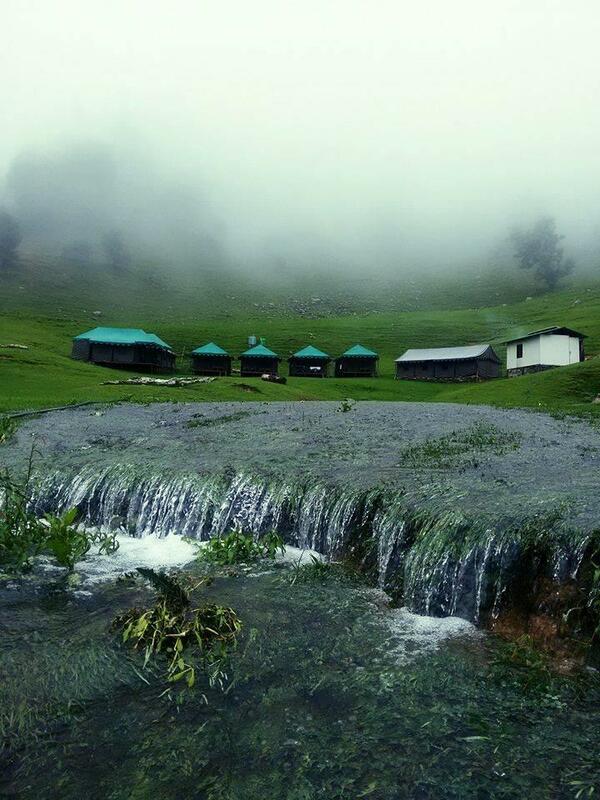 Snow clad mountain, green meadows, colourful tents, pebbles pathways and enthusiastic hikers in winter suits is what the link opened up to. Within 10 minutes, a whatsapp group was created with only three members, me, my wife and my brother in-law, Rahul. The decision on destination was unanimous. The only challenged was getting our leave sanctioned simultaneously. "Go ahead", "only if you exceed your target by a ton this month..! ", "this is the last time" three different boss and three positive response, the last one came from my boss. By 8pm we were at an Indian Oil filling station on the Delhi – Meerut highway. As we were crossing Muzaffarnagar by- pass, the Manager of New Bhandari Swiss Cottage, Rishikesh returned our call to confirm the room booking. We skipped dinner to avoid further delay and packed few rolls from IIT, Roorkee main gate. It was exactly 12.30am, when Ramesh, opened the hotel door for us. We started our onward journey next morning at around 10. After an hour drive we turned down the AC for a while to get the feel of fresh air. Ganges was towards our right, flowing in opposite direction. Even in the sharp curves She was calm, elegant and moving flawlessly towards the civilization. At Devprayag, all new travellers are bound to stop at the first glimpse of the confluence where the crystal green Bhagirathi meets the muddy Alakananda. There is always a joy in watching two rivers meet. This is the first spot for a selfie and a Facebook update….the tagline which came first to Priyanka's mind was probable "nature magic"
We took the first break 5 kilometres short of Srinagar. The shop was surrounded by 10 to 12 huge earthen mud pot rapped with red cloths. It was an exclusive Shikanji shop. Deepak Negi, the owner treated us to a refreshing glass of lemon juice. Probable the ambience and timing added more to the taste. We sat below a tree, facing the river flowing around 500 feet below us. There was a tiny village on the other side of the river. Everything seemed to be motionless in that village. For a while we all went through the same imagination "sab kuch chor kay, uss gaon may bas jau ….!" Crossing Rudraprayag, we took the highway, leading towards Kedarnath. Now, the river was flowing towards our left. To be on safer side, we filled the fuel tank once again. Asking for direction we realized there were two Chopta's. Our destination was Chopta via Ukhimath. So, we were supposed to continue driving on the Kedarnath highway for another 35km. We stopped to have lunch on a tiny road side dhaba. Alu jeera was served with red chilly gravy, may be the reason for a prospective upset the next day, but nevertheless it served our purpose. As we crossed Augustmuni, we got to see the first glimpse of the Himalayas. It was exactly 24 hours after my wife send me that magical link. Excited and thrilled, we stopped to take a couple of pics with river, mountain and road in the background. After covering 35 km from Rudraprayag we left the Kedarnath highway and took the route to Ukhimath. From Ukhimath, the actual ascend starts. The road become narrower and on every curve landscapes changes. As we pulled down the window glass, we got to feel the thin air. Priyanka was first to wear her sweater. Now, the snow clad mountains were towards the left, constantly treating travellers to a visual delight. For the next 30 minutes we were all alone, there was no other vehicle on the road. Chopta 24 Km…….. finally a milestone directing us to our destination. The time was 3.30pm. Exactly, 30 minutes later a sign board directed us to Magpie Resort. My wife had seen this resort on the net. But, since we did not had a booking, we decided to explore other places for accommodation. Chopta was still 8 km away. We were expecting Chopta to be a small village like town, with a market, tiny lamp post along the footpath, few hotels, a couple of restaurants, hut type tourist guest house and a mall road. But, there was absolutely nothing. We stopped near a small Dhaba and killed the engine. As I got down from the car, silence was the first thing I experienced. We stand still for a while like everything else in this silent valley and experienced eternal peace. On seeing us, three local youth approached, offering affordable accommodation. They showed us few basic rooms, which we would have agreed, had we been bachelors. We enquired for other option, but hardly found any. "If you are looking for better accommodation, try Magpie" a dabha owner informed us. We again drove back 8 km to reach Magpie Resort. The vehicle has to be parked near the main road. A narrow pathway along the jungle lead to Magpie. The first sign board reads "200meter ahead", the second board read "keep your voice low…don't disturb the tranquillity of the jungle". The lane lead to a huge green meadow surrounded on three side by mountain and jungles. The third side towards the right open up to the view of the Gangotri mountain ranges covered with snow. There were around 8 to 10 tents at the edge of the open side. Adjacent to the tents there is a restaurant build with bamboo and woods and a miniature solar set up. "Jiju, we are not going anywhere else" Rahul expressed taking a long breath. It was a dream place for any Delhite in search of relief from the mad May heat. The manager welcomed us. The manager guided us to the tents. They were beautifully maintained, with attached bathroom and running water. As Dilip, the manager explained us the stay packaged, my excitement suddenly dropped down. It was beyond my budget. I walked a few step ahead looking at the sun skipping behind the hills. But, the pair of brother and sister (Rahul and Priyanka), managed a good bargin. Happily we went back to bring our baggage's. For the next thirty six hours we were actually in heaven. Even the fire wood was burning at ease, we literally heard the sound of the burning fire. We sat down on the grass and stared at the sky. The moon was never as bright as on that night at magpie. We spotted Ursa Major and Usra Minor. I recalled the last time I spotted these two famous constellation was probable 20 years ago when I was in hostel. It's been years we have not seen such a bright sky with full of stars. I am sure people from Delhi and other metro-pollutian cities can relate to my experience. The best thing to do at the magpie resort is to do nothing. You don't feel like talking much, just walk around, pluck a fresh grass, chew it till you enjoy the grassy flavour and keep dreaming. At night the kitchen staff treat the guest to an awesome vegetarian meal. Even if you are staying for a day, the staff will make you feel part of their family. It became quite cool, as the night progresses. We skipped inside the tent and did not realized when we fall asleep. Next morning, I woke up to the sounds of the birds. Yellow bird, blue birds, mix colour birds and many more birds. I came out of the tent and it was a treat to see, so many never seen before birds roaming around. Both Priyanka and Rahul joined me and we went for a walk inside the woods. Returned back after an hour to take bath and have our breakfast. After breakfast, we went for trekking to Tungnath temple. This is one track people cherish for life. I have never seen such a scenic location ever in my life, not even in a Bollywood movie. As you keep climbing up, you keep experiencing a new canvas after every turn and the gentle breeze will keep remaining you that, it is for real. The simple principle of this track is, more you struggle to take your breath more breath-taking the landscape become. I have to stop here, as I am short of words to express the beauty of Chopta valley. Expression stops where beauty begins…!